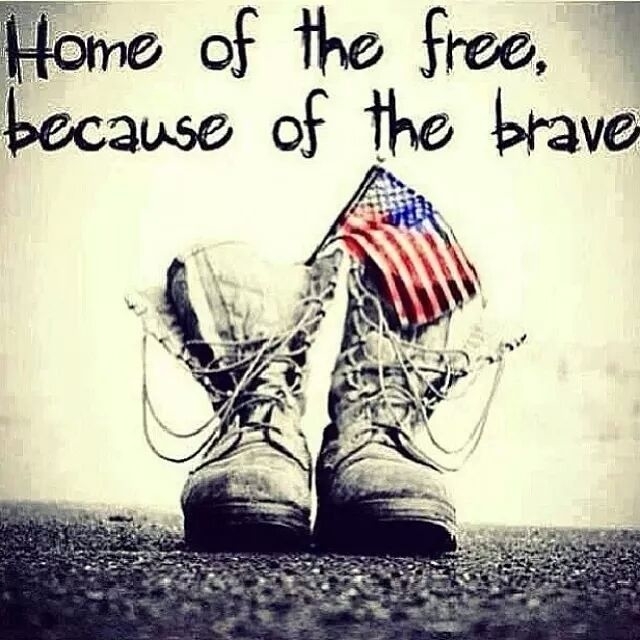 There are few words that can describe my gratitude for those who have served and currently serve in our military. 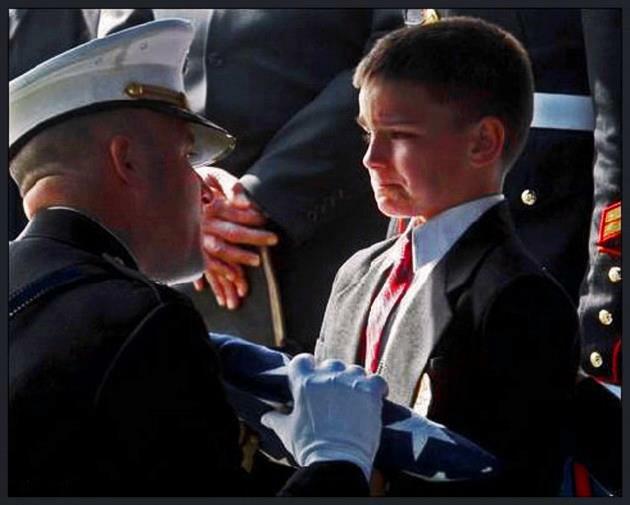 And unfortunately, not all of the brave are "in" the military. I am in awe of your strength. 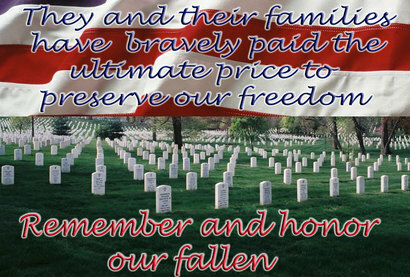 Over the past few years, I have tried to give back as my way of saying "Thank you" in honor of those who have served our country, especially for those who lost their lives while protecting my freedom. I've made Honor Flight Quilts (click on the tab at the top of the page to see those), I've made Quilts of Valor, and I've simply made patriotic quilts to give to individuals and families to say "Thank you." What I do, have done, and will continue to do really amounts to peanuts in comparison, but it's what I can do for them. I will continue to make and give these quilts for as long as I possibly can. 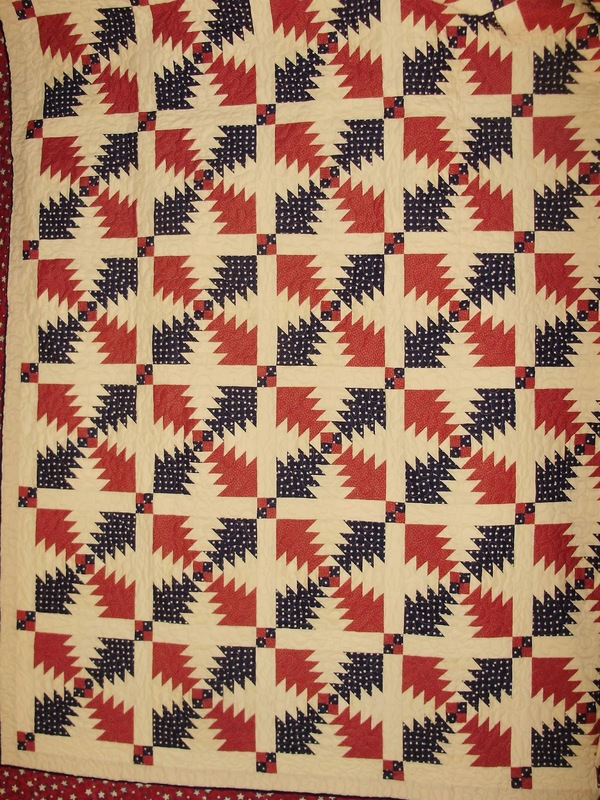 The following two quilts were made using the same pattern, but with much different fabrics. They were both given to family members. 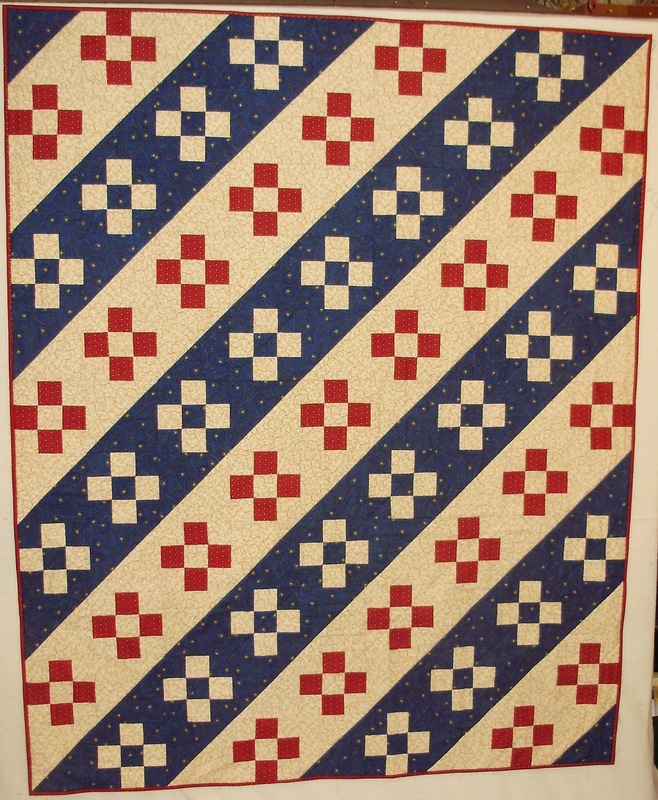 This nine patch and half square triangle quilt that I call Simply Patriotic, is a variation of Mary's 4 Patches on the Diagonal. I've made multiple variations of this quilt over the year and have donated all of them. I think it's time to make another one, but make it scrappy. This wall hanging is at my house and I display it in honor all of of my family members who have served, or who are currently serving. I am proud to be your daughter, aunt, niece, or cousin. Thank you! This large (king size) pineapple log cabin quilt is also at my house. This took me a very long time to complete (it was packed away for a while), but it was well worth the time and effort. This quilt has served me well over the years, but not in how you may think. Besides the obvious use of a quilt, this particular quilt is a reminder to me of how to persevere and complete what I start, no matter how challenging. I ran into a number of obstacles while working in this. Since I was pretty new to quilting when I started this and wasn't following a pattern, I was not very generous with my required fabric amounts and therefore had to come up with some very creative piecing methods. I was also teaching myself a new technique and that was definitely a challenge. I am proud to have met my challenges and finished this quilt; but I'm even more proud to be an American. Whenever I use this (it is always on one of the beds in one of the spare rooms), I am reminded of the dedication and perseverance of our military and I am forever grateful. And this quilt top, (Simple Gifts is the name of the quilt and I know that it's in a book, but I can't find the name of the book - or the book. ), is ready for quilting. It has been done for a while, but is still in the "To Be Quilted" bin, I need to get that out and resolve that. 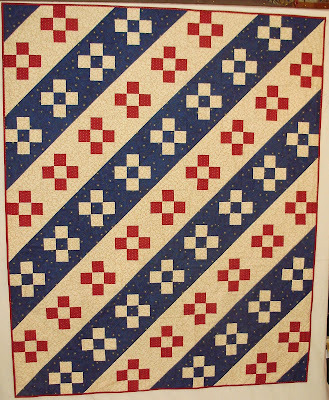 I have a few other patriotic quilts ready for quilting and I already have homes for them, so you should be seeing pictures of those posted here soon. I too, have family members who served and are serving. I am humbled by their bravery and am so very grateful. 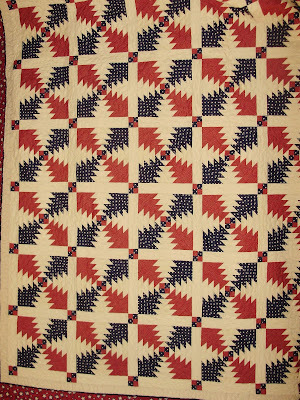 Your patriotic quilts are beautiful--you've inspired me to make my next quilt one that is patriotic and to donate it when it is completed. Thank you for the wonderful, inspiring blog!